Improve the clarity of cell phone calls and reduce the number of dropped calls while on the road with the Wilson Mobile 4G Cell Phone Signal Booster. The product includes everything you need to capture a weak cellular signal, transmit it into your vehicle, increase the cellular signal strength, and improve the performance of your cell phone, regardless of which carrier you use — 3G and 4G! The result is improved cell phone reception, fewer dropped calls, and increased data transmission rates while traveling. When traveling, you often encounter areas where the cell phone signal is weak or blocked due to distance from cell towers or obstructions such as buildings or hills. 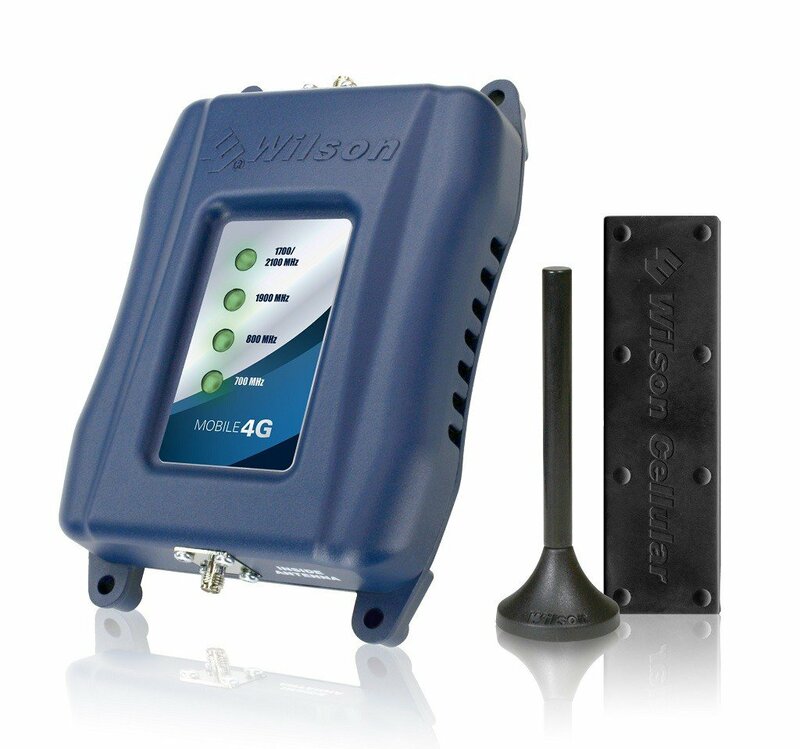 The Wilson Mobile 4G Signal Booster captures a weak cellular signal, transmits it into vehicle, and boosts the signal strength to and from your cell phone, resulting in better call quality, fewer dropped calls, and increased data transmission rates. The Mobile 4G uses three primary components – an outside antenna, the signal booster, and an inside antenna. 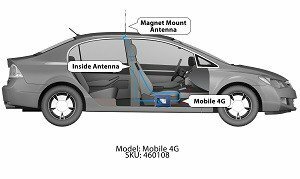 The outside antenna, which is mounted magnetically to the roof of your vehicle, captures the weak cellular signal from the nearest tower. It then transmits the signal to the signal booster inside your car, which increases the signal strength before transmitting it to the inside antenna. Your cell phone then picks up the improved signal from the inside antenna and transmits back to the inside antenna, through the signal booster and to the outside antenna, sending a stronger cellular signal back to the cell tower. The Wilson Mobile 4G Signal Booster is especially helpful for people who rely on their cell phones while traveling. These individuals can range from sales professionals to truckers to people who travel alone and want better cell service in case of emergencies. A stronger cellular signal allows you to stay in touch with clients, vendors, and the home office, or get access to emergency services in remote areas. You also get improved data transmission, enabling you to get the information you need between locations. The Mobile 4G increases cellular signal strength on 3G and 4G networks across all major cellular carriers. An outside antenna that mounts magnetically to the roof of your vehicle. This antenna captures the signal from the nearest cellular tower. The Mobile 4G signal booster, which is placed inside your vehicle and connects to the outside and inside antennas to increase the strength of inbound and outbound cellular signals. 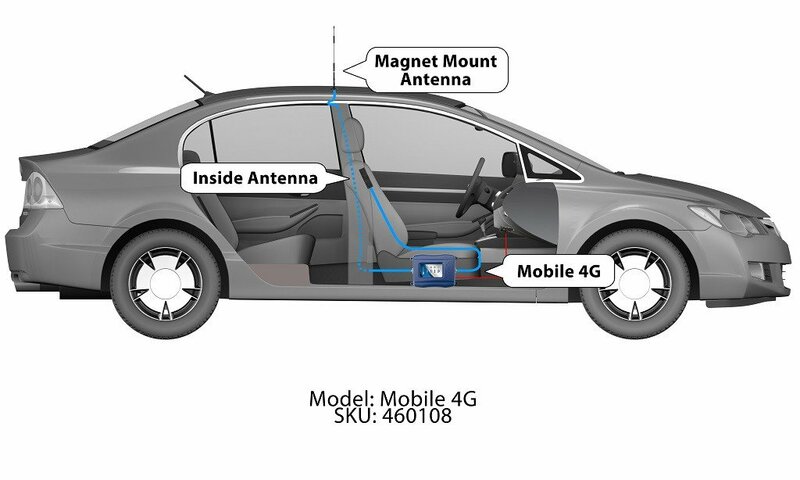 An inside antenna, which is placed inside your vehicle and connects to the Mobile 4G signal booster to transmit the stronger cellular signal to your cell phone. Simple installation instructions and contact information for additional support.